On January 1, I set a goal to get things done in 2016 -- those things that I have not done for reasons of fear, apprehension or just plain procrastination. One of my big goals for 2016 is to start a style business beyond my blog. One of the main reasons I started my blog and a primary reason for attending Parsons to study Fashion Business and Design (more about that here) was to work as a stylist - so I could help women look their best and feel confident. 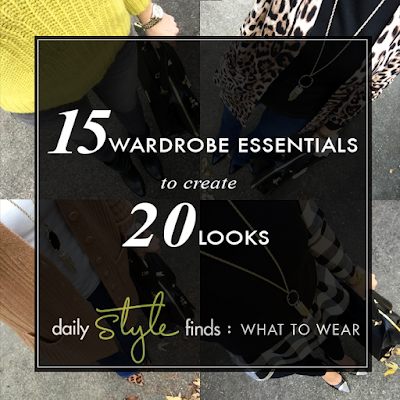 So, today, I am happy to announce the launch of DAILY STYLE FINDS: WHAT TO WEAR. DAILY STYLE FINDS: WHAT TO WEAR is a style series that will show you how with only 15 wardrobe essential pieces (the ones all women should have in their closet) - you can create 20 stylish, on-trend head-to-toe looks. Each of the 20 looks will be presented in a stylish format, along with some beauty suggestions. And, so, this meets everyone’s needs, you will be provided with both casual and work/professional options, so that each look works for all lifestyles. You can get this for FREE if you are one of the first 5 readers to sign-up using the discount code (Code: dailystylefinds). In addition, for all that register, you will have a chance to WIN $50 PayPal cash or Nordstrom Gift Card. If you are not quick enough to grab one of the first spots, you can still sign-up for only $9.95. Registration begins January 19, and the series will begin on February 1. This is sure to be a fun, new, and stylish adventure! Lastly, I would like to say "THANK YOU" to all my supportive blog friends who are helping me promote this new adventure. I cannot tell you how much their support means. Yay! This sounds like so much fun! You are so good at putting together stylish outfits! I know you will do great with your new venture! This sounds awesome!!! Go girl! Congrats on launching this! Excited for you. Congrats on doing this, such a great idea! Congrats on launching this! Such a fabulous idea!! Discovered this through Curly Craft Mom, and i am excited to be a part of it. Congratulations on this new adventure. Congrats Lisa on this new venture!